We are happy to welcome you in our E-Shop! Please, take a note: E-shop is still under construction, so it is possible that some categories are temporaly empty. But we are adding many new items every day, so you can find exactly what are you looking for tomorrow. 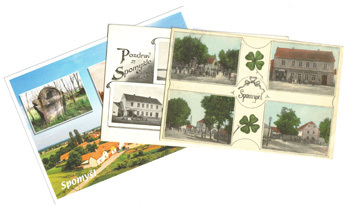 All postcards which we buy, we present to you and only offer in our E-shop or various internet auctions. On our web site you can find a links to our auctions that are on Aukro and eBay portals. Our E-shop is mostly focused on the sale of antique postcards. We are planning to expand our offer further by collecting of material related to topography, philately material(entirely), old company correspondence, bills, etc. You can find this material in our E-shop either in separated categories, which we will add, or in the subcategory – a related city. For example, a savings book of a savings bank in Mělník will be registered in the category “savings books” and also in the subcategory “different region of Mělník”. We believe that you will like our E-shop and that we can successfully provide a source of material for your collection. If you like our e-shop, please add us to your favourite websites. Adress : Nábytek Spomyšl s.r.o.